Identifying and controlling White Clover in residential lawns. White Clover is very apparent in lawns in late spring and early summer when they are producing their white blooms. The appearance of white clover is a low growing; mat forming; round, dark green leaves in groups of three; multiple white and pink-tinged flowers in late spring and early summer; soft stems and fleshy roots. White clover will flourish in soils that are low in nitrogen and pH. So a good Lawn Fertilization program will help control infestation. Control: In an Organic Lawn Care Program you can just let it grow or add nitrogen, lime, compost. 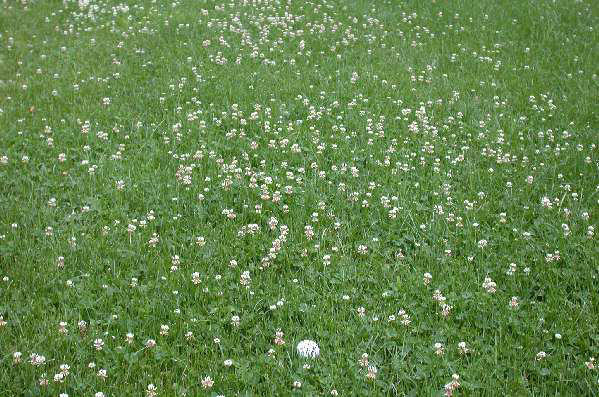 In residential lawns white clover is easily controlled with some sound Lawn Mowing practices and lawn fertilization techniques.